"The music is a great bridge between the world of nature and the world of music." Cardinal (4:09) This beautiful songbird has at least 28 songs of its own. I've chosen a simple two-note pattern as the motif for this tune, which I wrote in memory of Alberta Barker Kendall, who loved this bird so. Carolina Wren Rag (3:37) This saucy little bird does what most wrens do--hides in a thicket and taunts birdwatchers. Its song seems to lend itself most fittingly to a rag. The Waltz of the Whippoorwill (3:22) My image of the whippoorwill shall always evoke the falling star and purple sky of Hank Williams' hauntingly beautiful waltz, "I'm So Lonesome I Could Cry," which I first heard in 1956 as my family crossed the Great Plains in our Ford station wagon. When I mentioned this to an old Texan, he told me that it would be a great day when they got rid of the whippoorwill with its constant banter. It drives them crazy at night. Oh, well. Western Kingbird Air and Reel (4:01) My wife once spotted a western kingbird on a farm in Kansas, sharing a fence with an eastern kingbird. The fence was running north and south. Here's a pair of tunes from the song of the western kingbird, who was much more musical than its eastern cousin. California Quail (4:45) Sometimes in the early morning of a cold, foggy winter day, I'll open the door and startle a covey of 25-50 of these beautiful birds feeding in the pines. They'll start up, and in a flurry, fly off into the grey. Imagine spending your life with a black tennis ball dangling between your eyes, and you'll have an idea of what it must be like to be a California Quail. 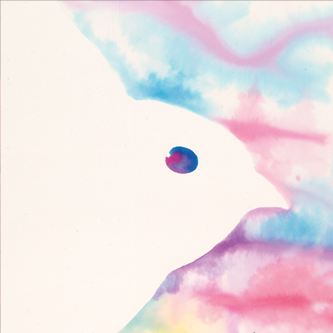 This song evokes the peace these poor birds will never know. Chickadee Polka (2:45) Perhaps the most readily recognized of this collection, the chickadee's little call practically dictated the whole tune. These busy little birds polka their way up, down, across and through a tree or bush, singing the whole time. Swainson's Thrush (3:26) Thrushes are known for their beautiful flutey songs. This one was named for William Swainson, a 19th Century British naturalist and ornithologist, who in a dangerous and exciting time traveled through North and South America studying and collecting birds. I hope he liked waltzes. Eastern Meadowlark (3:27) Most field guides tell bird watchers that the only reliable way to distinguish eastern from western meadowlarks in the field is by their song. So if you don't hear the harmonica, it must be a western. Greater Prairie Chicken (3:35) John Terres writes in his Audubon Society Encyclopedia of North American Birds that this prairie dweller has not reacted well to the loss of its tall grasslands to the European settlers. This tune is a lament for a time when the bird shared the prairies with its neighbors in a more equitable arrangement. Western Bluebird (3:15) I spotted my first western Bluebirds long after they had spotted me. Doing their leaf imitations, they watched silent and motionless from the branches of a tall Sycamore tree in the hills near Sunol, California. This beautiful bird faces an uncertain future. Varied Thrush (2:29) A solitary male sat on the top branch of a huge fir tree near our house one evening, watching the sunset. In eight years I haven't seen that again. But I'll continue to look. Thanks to Marti Kendall for love, devotion and inspiration, all the Weeds and Kendalls, Jorge and Pepin Montero, Thom and Myra Jones and family, Peter Crockett, Michael Rugg, Darol Anger, Chuck McCabe, Virg Evans, the fiddlers of North America for a beautiful and many-faceted tradition, the instrument builders who keep up happy, and the bird watchers and birds for keeping each other in line. 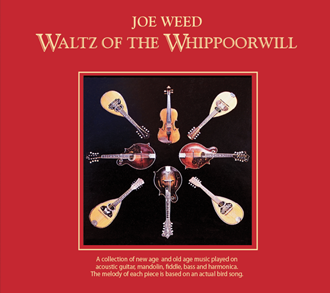 This album is dedicated to Jeffrey Joe and Katie Elizabeth Kendall-Weed. 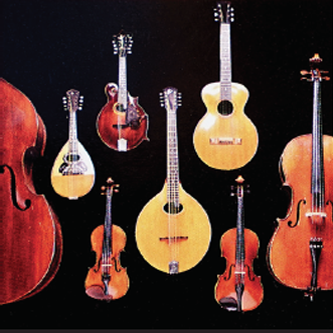 A collection of original music played on acoustic guitar, mandolin, fiddle, bass and harmonica. The melody of each piece is based on an actual bird song. Underlined portions of music are actual birdsongs. My image of the whippoorwill shall always evoke the falling star and purple sky of Hank Williams' hauntingly beautiful waltz, "I'm so Lonesome I Could Cry".